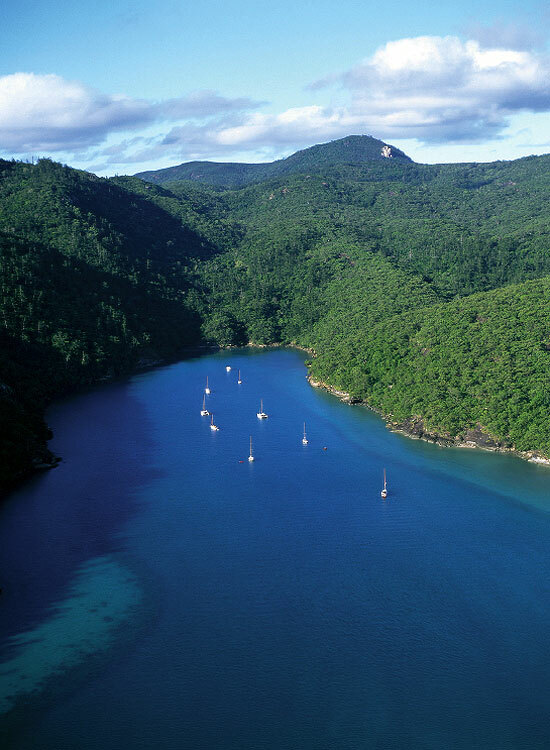 Mountainous Hook Island, the second largest of the Whitsunday Islands boasts thick forests, beautiful beaches and walking tracks. It’s a popular boating destination, as it has a diverse selection of anchorages, ranging from fjord-like inlets to coral reef-fringed bays that attract divers and snorkellers. Spectacular Nara and Macona Inlets both cut deep into the southern coast to provide two seemingly landlocked boat anchorages. Take the dinghy ashore at the northern end of Nara and you’ll find a short walking track that leads to a waterfall (during the wet season) and a cave containing Aboriginal rock art. Spectacular Nara and Macona Inlets both cut deep into the southern coast to provide two seemingly landlocked boat anchorages. Campers are spoilt for choice at five remote beachfront camping spots dotted across the coast, with the most spectacular being Maureens Cove for it’s astounding snorkelling. The coral rubble beach can be a bit harsh on bare feet, so make sure you have tough reef walking shoes. Diving and snorkelling are also superb at Butterfly Bay, a popular stopover for charter boats that pick up one of the free public moorings. Low-key accommodation is at the beachfront Hook Island Wilderness Resort (www.hookislandresort.com) overlooking Whitsundays Island. Aimed squarely at the budget-conscious, there’s an aging underwater observatory jutting out somewhat conspicuously into Hook Passage. Getting There: Boat transfer from Abel Pt Marina to Hook Island Resort, otherwise take a charter boat to one of Hook Islands bays.